Garden All Year With These Amazing Indoor Planters! If you grew a garden this summer, you should be enjoying the bounties of that harvest right about now. My mouth waters for home-grown tomatoes and other produce, but I have to say, fresh herbs might be my favorite of all. Every year I tell myself I'll do an indoor herb planter and keep my herbs growing all through the winter. Maybe this will be the year I finally do it! To provide a little inspiration, I've gathered a few cool indoor herb planter ideas (like those re-purposed crates pictured above). Scroll down for five more! Hang your herbs up high in an awesome suspended planter like this. Form and function with a twist! Put that bar cart to use hosting plants instead of drinks. Have you seen this DIY planter concept floating around on Pinterest? I think it looks pretty cool! Learn how to make your own wall-mounted mason jar plant pots here! Save your old tea tins and re-purpose them into pretty windowsill planters like these. So fun! 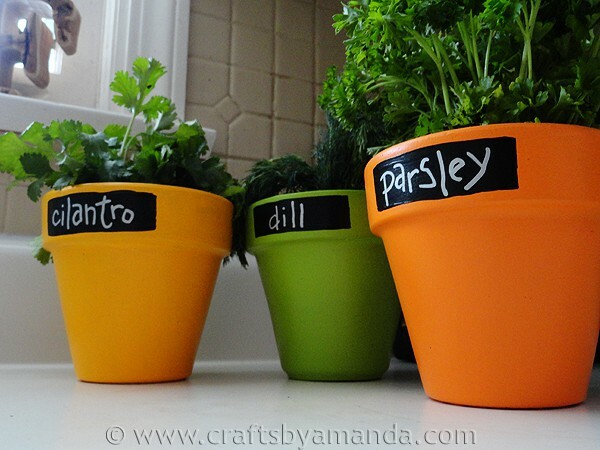 Dress up your basic terracotta pots with a coat of paint and a chalkboard label. The happy colors and green, green plants would certainly be a welcome sight during those cold winter months, I think. Have you kept an indoor herb garden before? Any tips or fun planters you've dreamed up that are worth sharing?